Enlarged Pores and Acne Ice Pick Scars. Are they related and are the treatments the same? Posted in Acne Scar Treatment, Procedures, Scar Removal / scar reduction / scar revision / scar treatment | Comments Off on Enlarged Pores and Acne Ice Pick Scars. Are they related and are the treatments the same? 31 year old female with acne scars. Single mother and she wants to get results for the money that she is going to spend. Your acne scars show some volume loss. You scars also show what we call rolling scars and maybe very wide boxcar scars. Any single approach is not likely to give you the best results like lasers, fillers, or deep chemical peels. You will definitely need some treatments in the deeper layers of your skin as well superficial treatments and this is where combination approaches help in getting the best results. We have an approach that uses five to seven steps that treats all the layers of your skin and that is done in about 2 hours. This can help you and we have done it before for people just like you. We have helped people with all different skin tones, and ages and different scars. This procedure is called the Acne Scar Vitalizer Treatment. Posted in Acne Scar Treatment, Procedures, Scar Removal / scar reduction / scar revision / scar treatment | Comments Off on 31 year old female with acne scars. Single mother and she wants to get results for the money that she is going to spend. Large pores and scars from acne that are similar can be described as an ice pick scar. Ice pick scars respond differently than other acne scars like box car or undulating scars. Ice pick scars require that the skin be raised up to the rest of the level of the skin. What is required is controlled trauma from chemical peels or lasering to do this. The skin anatomy can explain some of the reasoning behind this. There are multiple layers in the skin. There’s the Superficial dermis and then there’s reticular dermis and deeper parts of the skin. Ice pick scars are more in the superficial and upper reticular dermis and are formed of tight scar tissue. They require controlled trauma to get them to raise up. In terms of your Retinoids, you may want to consider cutting down on doing them everyday to maybe once a week. You can find what your skin responds to. Often times people put too much retinoids on at once and too many consecutive days that your skin can get burned out. Having big lips can be really important for someone’s looks. Big doesn’t mean that increasing the size is going to do it all. You have to know the aesthetics. Based on Dr. Young’s Theory on Beauty. The upper lips should be 1/2 the colored part of the eye or iris. The lower lips should be 1 Iris Width. You can click here and read more about Dr. Young’s Theory on Beauty. The width of the pucker is also important. If you follow the links you can read more about Dr. Young’s theory. Essentially the pucker should be about the same width as the width of the eye. Why is the lips so important to aesthetics. The lips are the entrance to the mouth and oral cavity. It is associated with many elements of humans animalistic part of the body. The lips and mouth are associated with eating, yelling, biting, i.e. some of the most primitive elements of our body’s. When you enhance the lips you enhance someone’s animal sexuality. There are temporary and permanent options. The main option for temporary lip augmentation are fillers. Permanent options include Permalip Silicone Implants, Lip VY Advancement, Lip Lifts, and Fat injections. you can click here to read more about these options: Lip Injections Augmentation of Seattle Bellevue. If you look carefully the incision goes behind the tragus. The tragus is the cartilage skin composite tissue that sits in front of the ear canal. 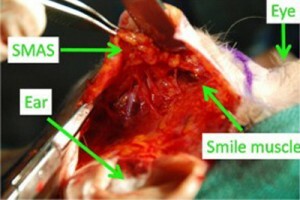 You can take the incision either in front or behind that piece of tissue. Below is a close up of the incision. 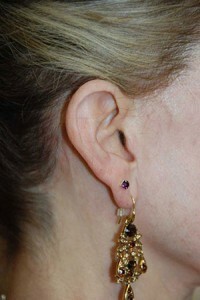 So when do you use the pretragal or in front of the tragus and do you go behind the tragus? 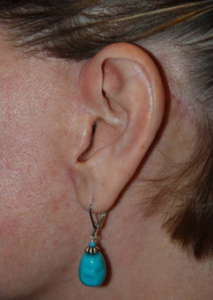 The incision behind the tragus can be done for non-smokers and patients without peripheral vascular disease or diabetes. It should be reserved for the healthy patient with less chance of small vessel disease. The thought is that the tragus is an added distance from the blood flow and would be put at risk for skin death there if you were to put the incision behind the tragus. People with more chance of small vessel disease, we like to place the incision in the pretragal location or in front of the tragus. We like to find a wrinkle that is obvious or would be a good location for the incision. Many times, especially in men, there is a wrinkle in front of the ear that can serve as an obvious place to place the incision. Hello there and thanks for visiting. 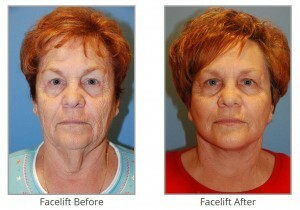 So we wanted to talk about what are thoughts were on today’s topic of facelifts and how they stand today. Very simply, we have a simple approach to things on the face and neck. If you have jowls we would suggest the facelift first. 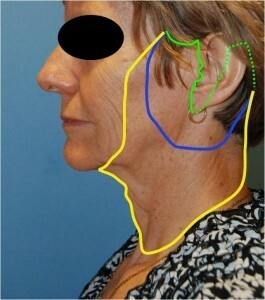 If you have neck banding or neck laxity, a neck lift is ideal. For the rest of the face we suggest the YoungVitalizer. Below we will discuss more on why we choose those options for simplicity. 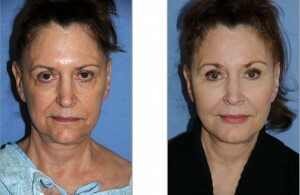 The facelift procedure is done through an incision around the ear. For the pull in the face the solid green is used. 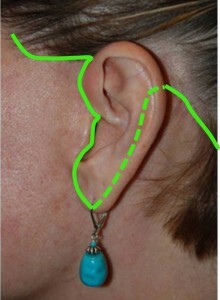 For more action in the neck the dotted green line is used. The blue indicates the undermining that occurs with a mini lift. The yellow denotes the undermining for a more complete face and neck lift.